Grab your Easter word search bundle today! A word search puzzle featuring words associated with the springy holiday Easter. This puzzle is great for your celebration or any time during the year when learning about this holiday. Use this sheet as part of your teaching curriculum, a treat for early finishers or just for fun. Word List: April, Baskets, Birth, Bonnet, Bunny, Candy, Chicks, Chocolate, Christian, Crucifixion, Decorate, Dinner, Ducks, Dye, Eggs, Good Friday, Ham, Hunt, Jesus, Lamb, Lent, Mass, Palm Sunday, Passover, Resurrection, Sacrifice, Spring, The Last Supper, Third Day, Tomb. A word search puzzle featuring words associated with the Passover. This puzzle is great for your celebration or any time during the year when learning about this holiday. Use this sheet as part of your teaching curriculum, a treat for early finishers or just for fun. Word List: Bitter Herbs, Blood, Commemoration, Door Posts, Dusk, Egypt, Exodus, Festival, Fifteenth, Freedom, Hebrew, Hyssop, Israelites, Jewish, Lamb, Liberation, Lintels, Matzo, Moses, Nisan, Pesach, Pharaoh, Roasted, Sacrifice, Seven Days, Sheep, Spring, Ten Plagues, Unblemished, Unleavened Bread. 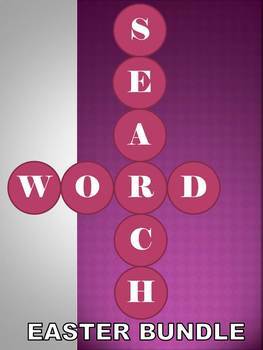 A word search puzzle featuring words associated with the resurrection story from the Bible. This puzzle is great for Easter or any time during the year when learning about Christ rising from the dead. Use this sheet as part of your teaching curriculum, a treat for early finishers or just for fun. Word List: Angel, Anoint, Crucified, Dawn, Disciples, Do Not Be Afraid, Earthquake, Fled, Galilee, Guards, He Has Risen, Heaven Jesus, Joanna, Joy, Lack of Faith, Mary, Mary Magdalene, Mourning, Peter, Preached, Son of Man, Spices, Stone, Strips of Linen, Third Day, Tomb, Weeping, White As Snow, Worshiped Him.